Ed Miliband will step up the war of words over the coalition's health reforms today, warning 6,000 nursing jobs are at risk unless the health bill is defeated. Ed Miliband will step up the war of words over the coalition’s health reforms today, warning 6,000 nursing jobs are at risk unless the health bill is defeated. 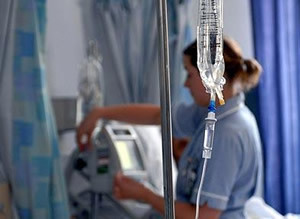 The number of full-time qualified nurses fell 3,516 from 281,431 at the election to 277,915 in October, according to data from the NHS Information Centre, while the Royal College of Nursing has identified 5,000 nursing posts at risk, comprising both qualified nurses and healthcare assistants. “In tough times and with little money around, the very first priority should be to protect the frontline NHS. “Instead, we have a government blowing a vast amount of money on a damaging back-office reorganisation at the same time as it is cutting thousands of nurses, with more than 3,000 already gone. Labour’s priority is protecting the frontline, not a pointless and damaging reorganisation of the NHS. “We’re calling for the bill to be scrapped, and for some of the money set aside to fund this reorganisation to instead be made available to the NHS to protect the thousands of nursing posts either already cut or set to be cut in the coming years. Miliband’s speech today follows his warning in yesterday’s Observer that there are “just three months to save the NHS”, describing the health and social care bill as a “misguided bid to impose a free-for-all market on our health service” that “must be stopped”. “The NHS is getting worse on this government’s watch. More people have had to wait longer than 18 weeks for treatment. More people are experiencing long waits in A&E and there are more cancelled operations. “We have already heard the arguments that will be played back against us by the government. None of them holds water. First, the government will say opposition to the bill from health professionals is just from trade-union “vested interests” – as David Cameron implied at prime minister’s questions recently. I disagree. 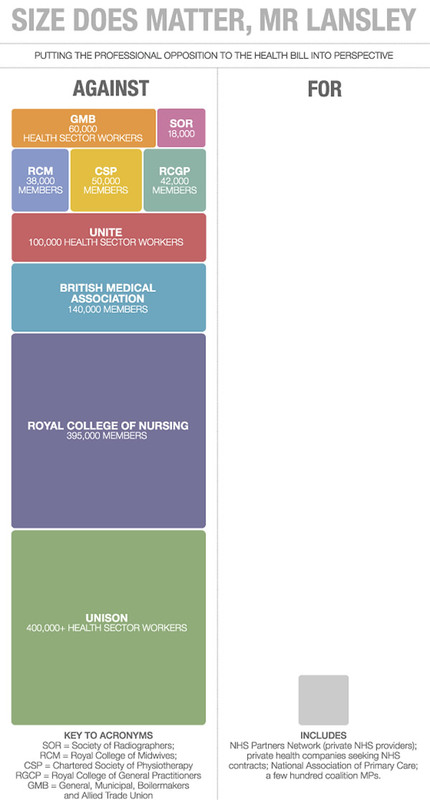 That opposition includes hundreds of thousands of doctors, nurses, midwives and others. “People at the heart of the NHS, staff and patients, would breathe a sigh of relief if the bill was dropped. Doctors and nurses could get back to their real job – of patient care. “At the last election, David Cameron cited his commitment to the NHS to show he was a different type of Conservative. And he promised no more top-down reorganisations. No one, but no one, thinks that the health and social care bill returning to parliament this week is any good [see chart 1]. Nurses and doctors have lined up to denounce it – even GPs, whom the legislation claims to put in charge. Professional resistance can be dismissed as “producer interest”, but not so the joint editorial published by three specialist periodicals, including the Health Service Journal. It is hard to think of a starker failure in domestic government since the poll tax. One note of political irony is that the Conservatives want to get ride of NHS managers yet fail to admit they introduced the management culture into the public sector witht eh belief that evetything can be run like a buisness, that coupled with both parties saying we will give you more accountability has led to resources being wasted. The simple solution is to reduce paperwork but to do it on the back of ideological reform when you can do it by changeing a couple of sentences is political stupidity.